Three unique layers. Three times the luxury. Choose from a full range of over 100 different stocks to create your custom Triplex Business Business Card. The supreme thickness of your card will be sure to make an impression with everyone you meet. With so many combinations available, you have the freedom to design the most personalized business cards ever. One of our most popular Triplex options is to select a colored stock for the middle layer, and a matching stock for the front and back. The Colorplan Collection offers an array of vibrant colored stocks to choose from, and you can see how these might look using the selection tool at the bottom of this page. For a truly beautiful business card, add letterpress to one or both sides, perfectly matched with our Cotton stocks. Thick 3ply letterpress business cards produced with letterpress. The relief effect was created using laser engraving and cutting technology on our 18pt Smooth Cherry. Also featured in this card is our 3-ply technique using 16pt Jet Black and our 12pt Uncoated on the reverse. 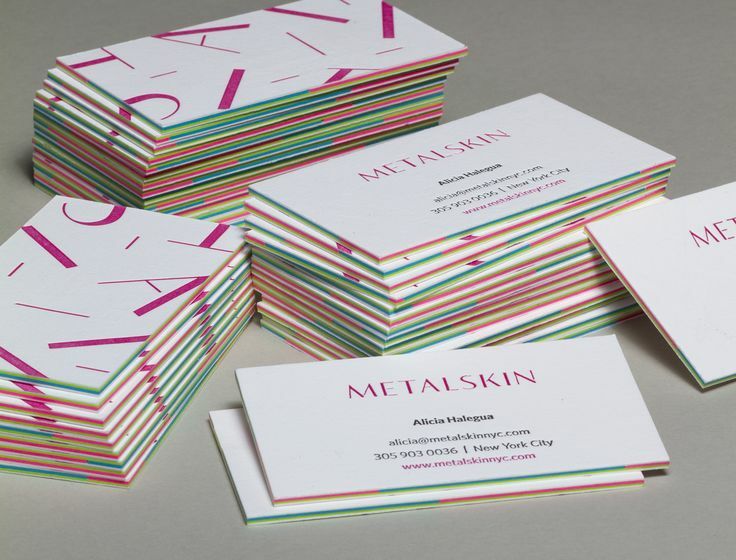 Triplex business cards use a similar process as our duplex (2-ply) cards, where two stocks are pressed together to create a double thick card or even combine two different types of paper for the front and the back. Triplex cards are special in that they are a 3-ply card, taking it one step further by allowing for a colored stock to be placed in the center, which creates a multi-colored edge effect and extreme thickness. At Jukebox, you have the freedom to choose any two stock for the outside layers. This gives you the option to choose a different stock for each side, and select from our wide range of premium materials. Natural Birch Stock with Pink and Blue middle layers. We recommend choosing bright colors for the center layer as this achieves the most prominent effect; however, we can use almost any color of paper you need. Check out our Colorplan Collection for a wide range of paper options that can be used for any of the three layers in triplex business card. Specialty Services like foiled or embossed designs can also be requested with this product. We are not able to offer die-cut shapes for 3-ply cards at this time. Please note that design considerations for triplex cards are a bit different than that of a standard single ply business card. See: Layered Cards Design Considerations. What colors are available for Triplex Business Cards? What is the thickness of a Triplex Business Card? Regardless of which stocks you choose, the card will certainly be sturdy and extremely thick. Since our Triplex Business Cards can be made with any 3 stocks, the final thickness will vary depending on your custom selection. Specialty Sample Packs are $15; and include our Standard & Recycled Sample Packs, as well as up to 2 items from our Collections list and 2 items from our Add-ons list. You will also receive a $15 coupon to use towards your print order! Make sure to choose our Duplex and Triplex as on of the Add-ons in order to receive samples of our Wine Labels. Samples of our Triplex business cards can be ordered via a Specialty Sample Pack.